(Lafayette, LA) – The Boustany for Senate campaign released the following statement after the Federal Bureau of Investigation (FBI) announced it is re-opening the Hillary Clinton email investigation after new emails “pertinent to this investigation” surfaced. Democratic candidate for Senate and career politician Foster Campbell frequently says he doesn’t own any “tap dancing shoes” while deriding tap dancing politicians who don’t talk straight with the people. But Campbell has been doing some tap dancing of his own avoiding the question of whether he supports corrupt Hillary Clinton for President. 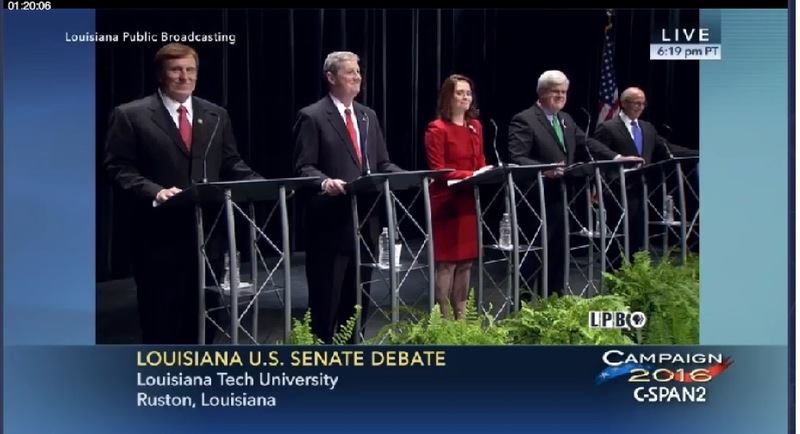 Tap dancing career politician Foster Campbell refused to even say Hillary Clinton's name at the Louisiana Public Broadcasting debate in Ruston. Posted on October 29, 2016 by Christopher J. Gary and filed under Hillary Clinton, Charles Boustany and tagged Charles Boustany Hillary Clinton Foster Campbell. Posted on August 30, 2016 by Christopher J. Gary and filed under Hillary Clinton, Donald Trump and tagged Donald Trump Hillary Clinton. Surely to put another stick in the spokes of Hillary Clinton's wheels on her run for the highest office is the release of this video from America Rising PAC that highlights some of her foibles and doublespeak from the past. Posted on April 18, 2015 by Christopher J. Gary and filed under Liberals, Hillary Clinton and tagged liberals Hillary Clinton democrats.